“Prior to 1923…only 17 installations had permanent chapels” leaving most chaplains to have to search for a place to hold service, often times outdoors (Gushwa, pg. 38). Even though Chief of Chaplains Axton “offered to help any chaplain who planned to erect a chapel, he confided in Chaplain Charles Graeser in a letter, ‘Of course we wish the government would make provisions for chapels at all permanent posts but I see no prospect of this being accomplished any time soon…”(Gushwa, pg. 39). In the Canal Zone in the early 1920s, Chaplain Benjamin Tarskey raised funds from individuals to build a chapel for his Soldiers, but the War Department denied his request for that chapel to be built, stating that it “expects Congress to provide appropriations for all necessary Army construction, and it is not considered desirable to accept private contributions for such purposes” Throughout the 1920s, a few chaplains utilized unused buildings and repurposed them for worship (Gushwa, pg. 39). In 1932, Chief of Chaplains Julian Yates “urged chaplains to be innovative in providing places of worship, and using whatever buildings could be scrounged and converted” noting that “troop housing and hospitals had priority over chapel building.” However, during the ’30s, “several chapels were built from WPA funds,” with nine of them “under construction in 1934-35” (Gushwa, pg. 71). But these chapels were of varying types and costs leading Chief of Chaplains William Arnold to arrange “for coordination of chapel plans so they would have the written approval of his office before being released to contractors” later noting to another chaplain that this policy had “…’already headed off some monstrosities'” (Gushwa, pg. 72). In the twenty-two years leading up to World War II, less than a million dollars was spent on chapel construction in the Army, chaplains using “theaters, mess halls, recreation buildings, tents, the parade ground or a clearing in the woods” instead of chapels (Gushwa, pg. 113). At the onset of World War II, “the thought to build chapels for units of the expanding Army crystalized during many conferences held in the Office of the Chief of Chaplains by the following participants: William R. Arnold, Chief of Chaplains; George F. Rixey, Chaplain Executive Officer; John F. Monahan, Chaplain Personnel Officer; A. S. Goodyear, Lt. Col., AGD Executive Assistant (OCCH, pg. 3). “The War Department accorded its approval, the 77th Congress included the thought in Congressional Bill HR-3617, Public 13 and the President signed the bill on March 17, 1941” (OCCH, pg. 3). “COL. William R. Arnold, Chief of Army Chaplains, gestures to emphasize a point at a meeting with division heads of his office staff…On the wall are architect’s drawings of recently approved, proposed Army Post Chapels” 5/3/41 (author’s collection). 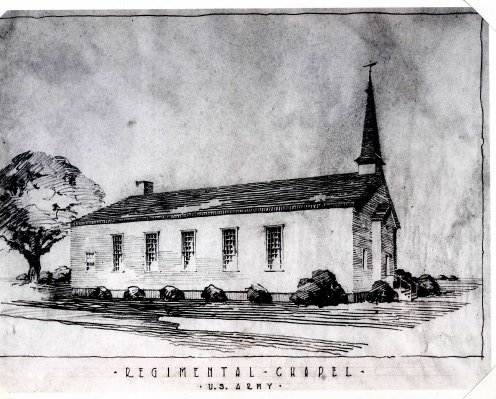 Photo of “Architect’s Drawing of Regimental Chapel” (Author’s collection). “The inside is equally simple and attractive. The seats, which accommodate 300 downstairs, are built with slat backs and have kneeling benches for those who use them in worship…The balcony, which seats an additional 57 worshippers, or which may be used for the choir, also contains the electric organ which provides music for all services. “It is the altar which attracts most attention. Designed to serve all faiths, it is movable and so constructed as to be adaptable for use by the several religious groups. A series of doors and panels, with a recess above the altar will provide the essential requirements for each type of service. Both pulpit and lectern are built so as to serve particular needs and, like the altar, are movable. There are two chaplains’ offices, one on each side of the altar, and at the front of the building are a consultation room and a cloak or vestry room, one on each side of the entrance” (OCCH, pg. 8). “In this program is reflected the Army’s concern for the moral welfare and spiritual training of the trainee and its recognition of the spiritual qualities of true military character. It is part of the Army’s determination to fulfill its duty to God as well as to country. This photo was taken just days before the Initiatory Ceremony of the Arlington Cantonment Chapel on 27 July 1941. Notice the Washington Monument in the background (author’s collection). Gushwa, Robert L., “The Best and Worst of Times: The United States Army Chaplaincy, 1920-1945” 1977. 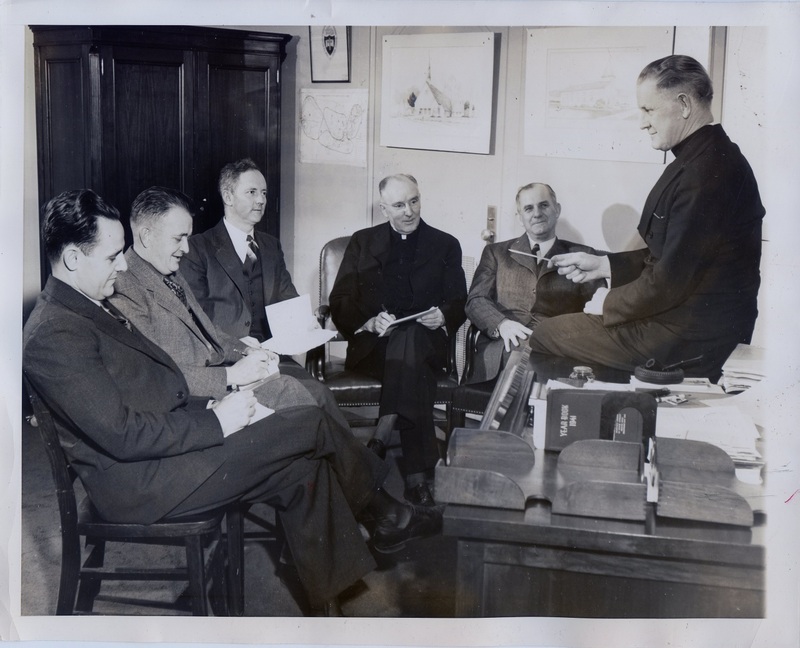 Office of the Chief of Chaplains (OCCH), “The Army Builds Chapels,” March 3, 1942. War Department, Bureau of Public Relations (WDBPR), “604 Chapels Will Be Built Throughout Army at Cost of $12,816,880,” Press Release, March 20, 1941 (contained in “The Army Builds Chapels”). War Department, Bureau of Public Relations (WDBPR), “Military Ceremony Scheduled for Opening New Army Chapel,” Press Release, July 21, 1941 (contained in “The Army Builds Chapels”).